The ideas I share on this blog will help presenters communicate more effectively using persuasive PowerPoint presentations. Visit my web site at www.ThinkOutsideTheSlide.com for more information on my training, consulting and resources. In a presentation where you have to share with the audience when some events happened or are planned to occur, don’t use a list of dates and descriptions. While accurate, a simple list does not help the audience to understand the time span involved and when the events occur within that timeframe. Instead, use a timeline visual. In this article I want to share some best practices for creating and using a timeline visual. A timeline visual does not denote length of an event, like a Gantt chart does. It shows when each event will occur. The visual includes a timeline to indicate the entire span that is being discussed, and shapes that indicate when each event happens. 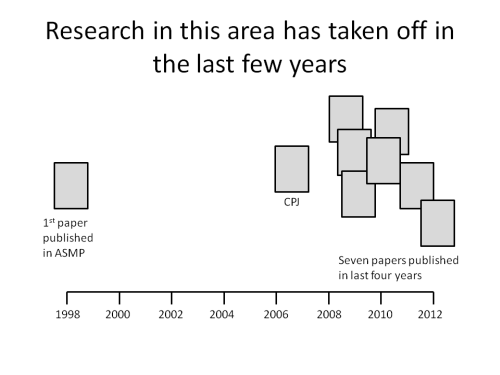 Here is an example from a recent presentation showing when certain research papers were published on a particular topic. The timeline should have marks to indicate the beginning and end of each time period, for example, each month. Typically the timeline will be a horizontal line with small vertical lines to indicate the separations. Make sure the marks are evenly spaced by using the Distribute function in PowerPoint and that there is text to indicate what time period each segment represents. If you need the audience to be able to see the divisions of the time segments across the whole slide, you can use dashed lines to separate the time segments instead of the small vertical lines. You have two choices as to where the timeline goes. Put the timeline at the top of the diagram if you want to focus on each time period and what occurred in that time period. Put the timeline at the bottom of the diagram if you want to focus on each event and when they happened. You then use a shape to indicate each event. I find a simple shape such as a square, rectangle, circle, or diamond is easiest. Make it large enough so that the audience will be able to easily see it. Add any text inside or outside the shape to indicate the exact date/time the event occurs, or text that will identify the event. When you are presenting the timeline visual, I suggest you build it item by item. Start by displaying the timeline and explain the context for the audience. Then add each item to the visual and explain why it is important, and any details about why it occurs at that time. If there are related items, you could display those together, such as showing all the events that occurred during a certain time period. Time based information is important in many presentations, and by using a timeline visual built with the best practices outlined above, your audience will be able to understand your message better. Last year a client asked me for some ideas on how to effectively present when your audience is attending via conference call. You have sent your presentation to the audience members via e-mail, and now you go through it while the audience listens to your over the phone. As the presenter, you don’t control what the audience sees on their screen the way you do through a webinar. Here are the ideas I shared with my client. First, you will have to ensure that your slides have slide numbers. Use the PowerPoint feature that automatically numbers the slides. In PowerPoint 2007, the Slide Number icon is on the Insert tab. The reason you need the slide number is that it will be your only way to help keep the audience on track with where you are in the presentation. You can’t see what slide they are on so during the presentation give direction such as, “Now moving to slide eight.” When someone asks a question, you can ask them what slide they are asking about to make sure you understand the context for their question. One of the other issues you will have to address is how to build information as you speak about it. When you control the slides, you can use build animation in PowerPoint. When you e-mail the presentation, you can’t be confident that every participant automatically will think of viewing the slides in Slide Show mode. You can ask attendees to view the slide show in Slide Show mode at the start of the presentation, and this can work in some environments. If you want to try to get people to use Slide Show mode, you can save the file as a PowerPoint Show file (PPSX file extension). This file opens in Slide Show mode when opened from an e-mail. Attendees will also then need verbal instruction as to when to advance to the next build on each slide. This may affect the flow of your presentation. As an alternative, you can build your ideas across multiple slides, which will work for attendees whether they are in Slide Show or normal edit modes. The final issue I addressed was how to have backup slides available in case someone asks a question about the details of what you are speaking about. These slides need to be in your PowerPoint file, the question is how to have everyone easily access the slides only if required. First, I suggest you place a banner across the top or bottom of your backup slide to indicate that this is a backup slide. This visual clue will quickly identify backup slides to the audience. I suggest you place any backup slide right after the slide it applies to instead of at the end of the file in an Appendix. It is much easier for you and the audience to access when it is close to the slide you are speaking about. Give verbal instructions to let the attendees know which slide you are moving to next, whether it is a backup slide or the next regular slide. If you can have everyone viewing the slides in Slide Show mode, you can ask the attendees to use the hyperlinks on the slides to quickly jump to hidden backup slides. PowerPoint presentations are delivered in many different ways, from live in front of the audience, to via webinar, to conference call, to strictly stand-alone via e-mail. For each delivery method, consider how best to use the technology that will add to your message. Use the tips in this article to present more effectively via conference call. Microsoft, PowerPoint, Windows and other terms are either registered trademarks or trademarks of Microsoft Corporation in the United States and/or other countries. Microsoft product screen shot(s) reprinted with permission from Microsoft Corporation. All books, products and seminars are independent publications and are not affiliated with, nor have they been authorized, sponsored, or otherwise approved by Microsoft Corporation.